Hey there Homebrewer! It’s another episode of the Homebrew Happy Hour back in your life! Have we ever mentioned how producing this podcast is the most fun we ever have during the week? Truly, it is and we thank you for listening and supporting the show. With that out of the way, we have got a fantastic episode lined up for you today! 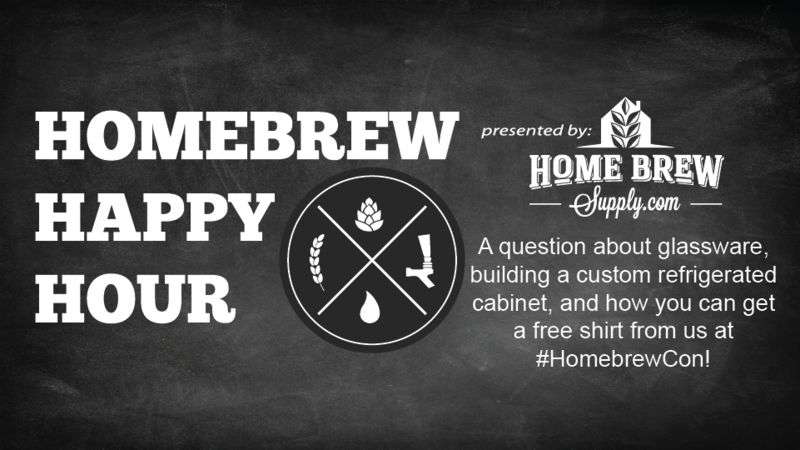 The guys chit chat a bit about the upcoming HomebrewCon… which reminds us that if you’re going to attend the show this year in Portland and want a FREE Homebrew Happy Hour t-shirt, click here (or here, or here, or HERE) and reserve your free shirt. We’ll make sure it’s set aside for you and all you have to do is come up to the booth and pick it up! OK – moving on, today’s show takes your questions on glassware and another one from a listener who is wanting to literally create his own custom kegerator. Not just a keezer, not a converted fridge, but a custom cabinet that he’s going to refrigerate himself. It’s a cool concept!